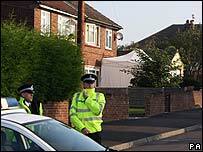 A father and son were two of three people shot dead at their family home in Hertfordshire. Keith Cowell, 52, and his son Matthew, 17, died alongside 33-year-old Tony Dulieu, of Billericay, in the shooting in Bishop's Stortford on Tuesday night. Wife and mother Nicole Cowell, 46, had left for work at Stansted Airport minutes before the gunmen arrived. Police are hunting two Asian men, aged in their early 20s, seen driving a red car away from the scene on Tuesday. A woman aged 54, believed to be Mr Cowell's sister, and a woman aged 23, believed to be Matthew's girlfriend Claire, were seriously injured in the shooting. Their condition remains serious but stable. A three-year-old girl called Angel, who is thought to be Claire's daughter, was found unharmed in the house in Plaw Hatch Close. She is now being cared for by child protection officers. Mrs Cowell's brother Roger Spellane, 55, a kitchen fitter from Wood Green, London, said his sister had left for work at about 2130 BST on Tuesday. Emergency crews were called to the house 10 minutes later. Mr Spellane said his sister had to formally identify her husband and son at the hospital morgue where their bodies were taken. "My sister is in a state of shock as you can imagine and I haven't really been able to talk to her properly," Mr Spellane said. "I know she is being looked after by her married daughter Charlotte." His 87-year-old mother Irene Spellane had also been told of the death of her grandson and son-in-law. 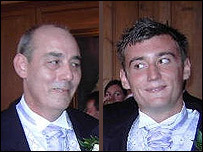 Mr Spellane said: "Keith was a lovely man and showed nothing but kindness to my family. I have known him for years. "They were married for 25 years and in that time I never had any problems with him. He was a lovely chap. "Matthew had it all before him at 17. I don't know what he did for a living. The last time I saw them all was at Charlotte's wedding last summer." Mr Spellane said the older woman who was shot and injured in the incident had been Mr Cowell's sister. He said the younger woman is Matthew's girlfriend Claire. Mr Spellane said the three-year-old girl taken from the house was not his nephew's child, but Claire's by a previous relationship. Ch Supt Al Thomas, of Hertfordshire Police, said: "We share the concern and sense of shock within the community. "Early information suggests this was a targeted incident and not a random attack." Post-mortem examinations were conducted on the three bodies on Wednesday but the results have not yet been made public.